Both on the left and the right, prominent donors and strategists are building new organisations to promote female candidates in the lead-up to the 2018 midterm elections. On the left, a new initiative led by Sen. Bernie Sanders’ deputies and surrogates will focus on electing working class women and women of colour. And on the right, the GOP sees an opportunity to promote conservative women, who are seen by voters as the ultimate political outsiders. In the wake of Hillary Clinton’s unexpected 2016 loss, political operatives and donors see an opportunity for women in politics — both on the right and the left. While women-focused political action committees have successfully propelled Democratic women into elected office for the past few decades, a new group on the left founded by Sen. Bernie Sanders’ supporters is looking to expand the slate of women candidates who earn early endorsements and big-dollar donations. And on the right, another new PAC, backed by some of the GOP’s most prominent benefactors, is looking to capitalise on the moment to promote conservative women in a party that has long rejected identity politics. On the Democratic side, the most powerful women-focused PACs — NARAL Pro-Choice America, Planned Parenthood, and EMILY’s List — have one thing in common: they choose the candidates they support based on their position on abortion rights. Nomiki Konst, a former surrogate for Sen. Bernie Sanders’s presidential campaign and reporter for The Young Turks, and Rania Batrice, a veteran Democratic strategist and Sanders’s former deputy campaign manager, think women candidates should be evaluated on a broader set of policy priorities. The two women, along with Our Revolution president Nina Turner, are in the the process of building a new PAC to recruit and fund working class women and women of colour on a Sanders-inspired “economic justice” platform. Scheduled to launch early next year, the group will recruit women who support a host of progressive policies, including a $US15 minimum wage, campaign finance reform, Medicare-for-all, free college, and criminal justice reform, among others, and who might be less practiced in big-dollar fundraising than candidates backed by more establishment groups. “I think the thing we learned from Bernie in the primary is that it’s possible to do things in a different way, understanding, of course, that everybody’s not going to be able to raise millions of dollars $US27 at a time,” Batrice told Business Insider of the group’s emphasis on small-dollar fundraising. While Konst and Batrice say the organisation will seek to work with other women-focused groups where their interests align, there is longstanding tension — exposed during the 2016 election — between women’s groups like Planned Parenthood and EMILY’s List and Sanders’s camp. Last month, after the Women’s March organisers announced that Sanders would be a featured speaker at their convention, many women, including EMILY’s List president Stephanie Schriock, condemned the decision, arguing that a women’s gathering shouldn’t feature a man. The new group is seemingly a direct response to what Sanders supporters see as the limitations of groups like EMILY’s List, which Konst has accused of “financially backing wealthy women, while raising money off of young/WOC,” referring to women of colour, and endorsing male over female candidates in some races. Earlier this month, a coalition of some of the GOP’s biggest donors and most powerful operatives officially launched a new women-focused PAC. Several billionaire benefactors, including the Mercer family, TD Ameritrade founder Joe Ricketts, and hedge fund founder Paul Singer, teamed up over the last year with wealthy female members of President Donald Trump’s cabinet, including Linda McMahon, head of the Small Business Administration, and Education Secretary Betsy DeVos, to fund the group, called Winning for Women. And many of the Republican Party’s most powerful female operatives, including former deputy White House chief of staff Katie Walsh and former New Hampshire Sen. Kelly Ayotte, are either leading or involved with the group, which has signed up 30,000 members over the last month and is aiming to grow to 400,000 in time for the 2018 midterm elections. The group’s goal is to promote online activism and recruit candidates with conservative positions on national security and economic issues in particular. “Winning For Women’s primary objectives are to build a national membership base of conservative female activists, and advance a policy agenda focused on national security and free-market principles,” the group’s communications director Andrea Bozek told Business Insider in a statement. Traditionally, GOP PACs focused on electing women, including the Susan B. Anthony List, and VIEW PAC, have fallen short of their Democratic counterparts, and experts say Winning for Women will have a similarly uphill battle to fight in a party where under 10% of the congressional caucus is women. Rosalyn Cooperman, a professor of political science at the University of Mary Washington who studies women in politics, thinks that in order to be successful, the group would need to make two unorthodox moves: getting involved in primaries and embracing identity politics. Democratic groups, like EMILY’s List, are writing off this latest GOP effort as just another low-impact public relations campaign. Schriock, the EMILY’s List president, recently told Cosmopolitan Magazine that she supports the idea of a “Republican version of EMILY’s List,” arguing that more women in GOP politics would act as a moderating force on the party’s policies — “more women will be better, period,” she argued. But she is deeply sceptical of Winning for Women’s efforts, which she characterised as both futile and hypocritical. Former Alaska Gov. 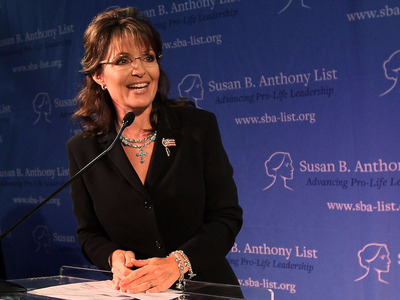 Sarah Palin speaks at the 2010 Susan B. Anthony List’s “Celebration of Life” breakfast. 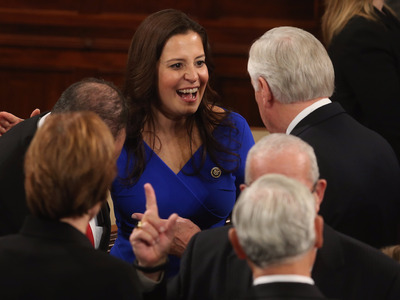 While women make up just 20% of Congress, Democratic women outnumber Republican women in the body three-to-one. Kelly Dittmar, a professor at Rutgers University’s Center for American Women and Politics, says that while Winning for Women’s success will depend on an array of factors, including what kinds of candidates it recruits and how much money it invests in them, 2018 might be a particularly good year for the GOP to focus on women candidates. A new survey published by the Barbara Lee Family Foundation found that Republican women hold some important advantages over Democratic men, in particular. Conservative women are more likely to be viewed by voters as political outsiders than their male counterparts or Democrats are, and are seen as more confident and more honest then Democratic men. The report found that voters see Republican women as stronger than Republican men on 10 of 13 metrics, including being knowledgeable, standing up for what’s right, and seeming in touch with people. And in a moment in which being a political outsider carries significant weight with voters of all political stripes, conservative women may have a distinct advantage over both their male counterparts and candidates across the aisle. Dittmar added that Republican women, who are generally more politically moderate than the men in their party, might represent strong alternatives for GOP voters who are fed up with Trump in 2018. “If there’s a backlash to the party, if Donald Trump affects these races negatively, if the electorate is particularly angry with what’s happening, they may be more willing to accept a candidate … who’s more moderate or at least presents a different perspective or a different approach,” Dittmar said.